Originally uploaded by gili k.u. 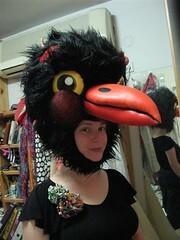 ‘a lift on a broom’ hamatmon theater 2008. my design (costums, curtains, masks, dragon). I also built all the masks. This exhibit was really crazy. The Costume Institute put it on, but put all the mannequins in the period rooms, which are usually empty (of both mannequins and museum-goers apparently). This one was crazy, since she’s holding her mask in one hand, and the raven face is supposed to be her actual face. The table in front of her has a whole bunch of bird statues (like she’s holding court, or something) and they had raven cries looping in the background. It was probably the most provoking exhibit we saw. Well, we know that others love ravens as much as we do… if you have personal raven (or crow or any corvid) costume photos to share, email me below.